Sorry that I did not write earlier this week, but I was in the “village” or “bush” in Nigeria unable to get internet services. Sekyen and I just arrived into Dubai on our way to Chennai, India for the Asian Race on August 1st. It was a remarkable week in Nigeria. 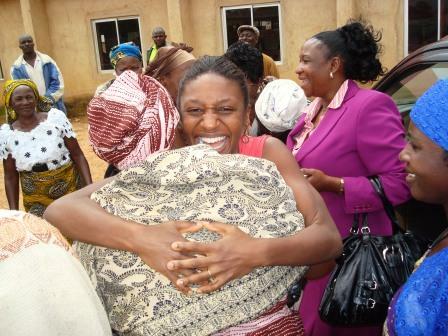 We flew into Abuja, Nigeria and drove 3 hours to the city of Jos where many of Sekyen’s family reside. The next day we traveled another 1.5 hours to Ampang West, a village in Plateau State where Sekyen’s grandparents live. It is a very rural location where her grandparents still farm today. 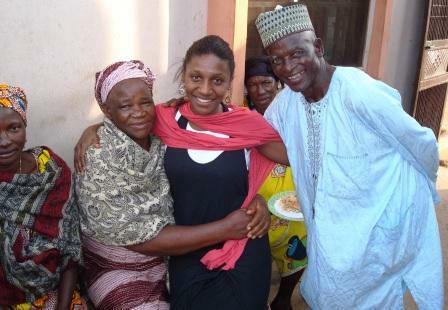 This was the first time that Sekyen has met most of these people in 25 years since she left Nigeria when she was 6 years old. As you could understand, it was a very emotional time. 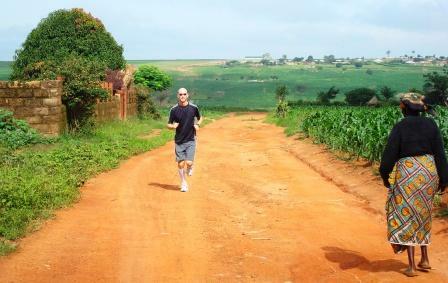 We had the opportunity to take a few easy runs in the village as well. Plateau State is situated in the middle of Nigeria on an elevated plateau providing cool temperatures and quiet living. Recently Jos, Nigeria has been in the news due to ongoing violence troubling the region. This has escalated a military presence and roadblocks. Our event directed by Daniel Mutfwang entitled the “Peace Race” was to use sports as a means of peace in Plateau State. We hope that the region stabilizes in the near future. On July 23rd, we had the opportunity to present a fitness seminar to the coaches and athletes of Plateau State and check the race course in the hard driving rain. 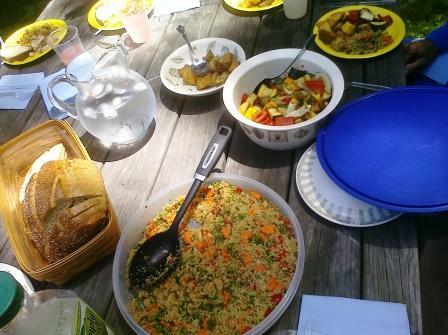 On the 24th, the “Peace Race” took place with many of the good runners from the area. We had the most difficult head wind yet on our trip as you can hear and see in video. Combine this with altitude and my strong cough and I was fortunate to run a 5:07.38 for race #4. We really thank all the participants and organizers of this special race representing the continent of Africa. We fly to Chennai, India on July 25th evening. I speak at Global Adjustments on my new book Creating Amazement on the 28th and speak at our sponsors at the O2 Gym on my new fitness regime on the 29th. This should be our most humid and hot conditions on our world tour. 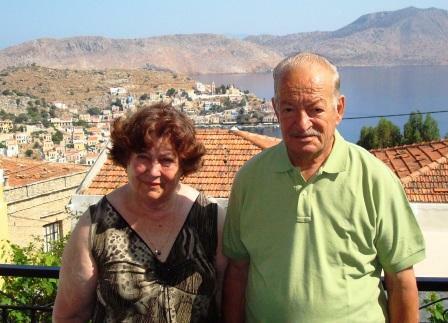 We have had a wonderful week in Symi, Greece. It was indeed a long journey from Argentina, but well worth the trip. Sekyen and I had the chance to take a boat ride around the entire island on Wednesday. The beach and cliffs of St. George were breathtaking. However, I paid for my day of swimming around in the cool crystal clear waters as I had developed a head cold/fever and spent the day before the race just resting. I did walk with the group wheeling out the course and setting up the 1/4 mile markers. This gave me good information to visualize the race over and over as I rested. Being a bit under the weather, I really focused on the task at hand and did not get “lost” in the middle of the race as in Argentina, because I knew where I was at all times. I also took advantage of two downhill spots on this course enabling me to run a 4:29.02. In the past, I have floated on some downhill portions, but today I attacked thinking I need every second before the altitude of Jos, Nigeria. The photo above at the end of the race with me from l to r: Austin Moench (who participated in the race with me as he is on the island for a summer internship with a local doctor), Deputy Mayor Haskas, Symi Visitor sponsor Wendy Wilcox and Dominic Lillicrap. 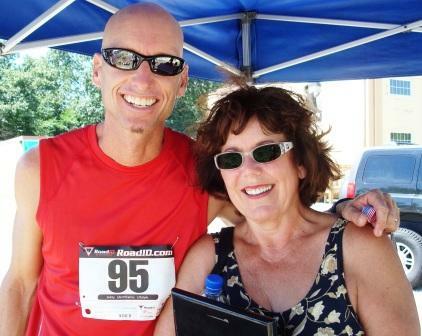 It was a special race as the Deputy Mayor of Symi, Ilias Haskas, who I met in Tarpon Springs in 2008. He traveled to Tarpon Springs, FL to establish a sister city connection between Symi and Tarpon Springs. On that evening, I promised the Mayor of Tarpon Springs and Deputy Mayor of Symi that I would take www.OneMileRunner.com to Symi in the next couple of years. So here we are two years later fulfilling our commitment to the sister city connection through athletic and cultural exchanges. Many thanks to Wendy Wilcox, Symi Visitor Accomodation www.symivisitor.com, for setting everything up for this European stop. She worked magic on the island during our few days here. Thanks to Nicholas Shum who was the race director for the Symi Mile – he did a great job getting everyone positioned in the correct places so the race went off smoothly. 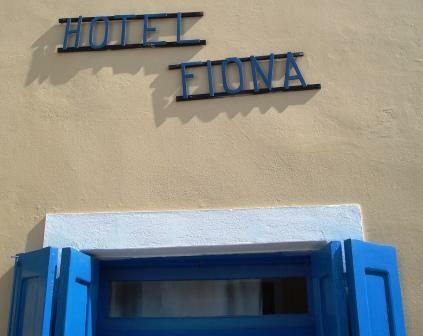 Thanks to Michalis and Fiona Nalkitis (in the photo below) and their son Nick as our hotel sponsor from Hotel Fiona. We are departing this afternoon after the race as we will catch the boat back to Rhodes and then fly back to Athens for the night before departing the next day for Amsterdam. We fly to Abuja, Nigeria on the 19th evening as we have a speaking presentation on the 23rd and the race in Jos, Nigeria on the 24th. We look forward to the 3rd race of “Around The World In Less Than 30 Minutes” on the island of Symi, Greece at 8am on the 17th. I will post the video and blog of the race immediately after the race as we need to catch a boat to Rhodes, a flight to Athens, and then a flight to Amsterdam before traveling to Nigeria, Africa on the 19th. We just flew overnight from Buenos Aires to Atlanta. We leave for Greece in a few hours, so I thought I would post our latest video from Argentina during our layover. Juan Lapadula from Urban Running Tours based in Buenos Aires, www.urbanrunningtours.com.ar, did a great job hosting our one-mile race. He was able to find a flat part of the city where we could run on Saturday morning and Juan organized all the details to make it official. If you ever take a trip to Buenos Aires, please contact Juan so his company can give you a running tour of the city. You will love the way you can see Buenos Aires! Unfortunately, the “fair winds” of Argentina were in my face and not on my back during this point-to-point race. I ran a 5:07.72 and have now given back the seconds I gained in North America last week. I hope to run better in Symi and gain a few seconds before my difficult races in Nigeria and India. We had a chance to experience America’s Independence Day in our first race in North America on July 4th and then travel to South America to celebrate Argentina’s Independence Day on July 9th. It was a long trip to Buenos Aires, but well worth the trip. Traveling from Buenos Aires, Argentina to Symi, Greece will take different modes of transportation. It was 10 hours from Buenos Aires to Atlanta, it will take about 11 hours from Atlanta to Athens, then we take a small plane from Athens to the island of Rhodes, then a boat from Rhodes to Symi. It will be an exhausting couple of days, but I hope to recover from the long travel and find some speed on the island of Symi. 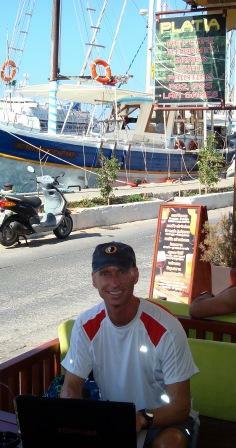 I am supposed to race the final mile of their marathon course on the island as it enters into Yilos Harbor. Sekyen and I arrived in Buenos Aires, Argentina early Tuesday morning. We flew through the night from Atlanta. With only an hour difference in time zones, the time change was not that drastic. We were met at the airport by Juan Lapadula, owner of Urban Running Tours www.urbanrunningtours.com, who is running our event. Juan showed us the race course on Wednesday in Puerto Madero. Buenos Aires translated means “fair winds.” Let’s hope that the “fair winds” on this point to point race will be at my back and not in my face on Saturday morning. 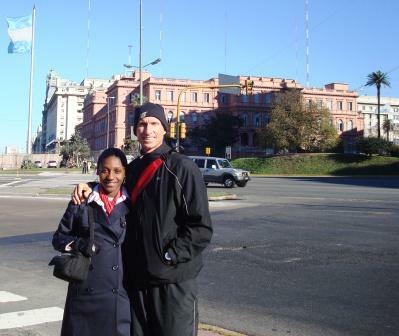 Sekyen and I had the opportunity to train and to check out the beautiful, European style city of Buenos Aires. We also had the opportunity to be amongst the passion for soccer during the semi-final of the World Cup in South Africa. Even though Argentina had lost earlier (the country was very disappointed), people still entered the plaza to watch the semi-finals on the huge big screen television. We will be on a plane before the final on Sunday afternoon, but we enjoyed being part of the throngs of people supporting and cheering the World Cup. 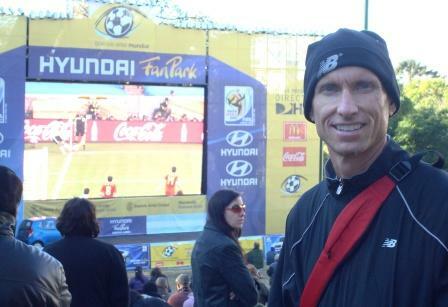 We race tomorrow morning in the cool temperatures of the Buenos Aires’ winter. Then we take the long trip from Argentina to the Greek island of Symi.